Available from 8" to 18"
Available in 10" to 18"
Available in 8" to 18"
Two Sizes 7" & 8"
Choose 5 1/2" or 7"
Baseball trophies in many different sizes and style options. Check out our styles below, if you something you like click on it. There you will see the different figure options available. We offer reasonable prices that is sure to fit your budget. 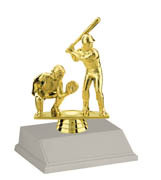 Each baseball trophy comes with 40 characters of FREE ENGRAVING.